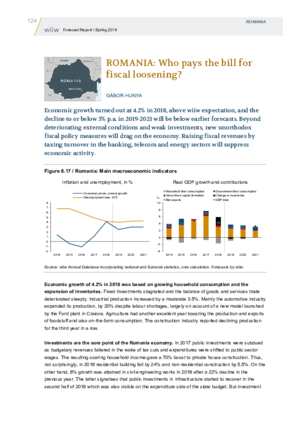 ROMANIA: Who pays the bill for fiscal loosening? Economic growth turned out at 4.2% in 2018, above wiiw expectation, and the decline to or below 3% p.a. in 2019-2021 will be below earlier forecasts. Beyond deteriorating external conditions and weak investments, new unorthodox fiscal policy measures will drag on the economy. Raising fiscal revenues by taxing turnover in the banking, telecom and energy sectors will suppress economic activity.